^ Madison, James (April 30, 1996). "The Federalist No. 43". The Independent Journal. Library of Congress. Retrieved 2008-05-31. ^ a b c An ACT for establishing the Temporary and Permanent Seat of the Government of the United States. Library of Congress. Retrieved 2008-12-12. ^ a b National Capital Planning Commission (1976). Boundary markers of the Nation's Capital: a proposal for their preservation & protection : a National Capital Planning Commission Bicentennial report. 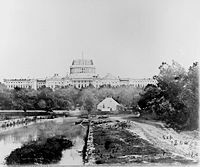 Washington, D.C.: National Capital Planning Commission; For sale by the Superintendent of Documents, United States Government Printing Office. OCLC 3772302. Retrieved 2016-02-22 – via HathiTrust. Digital Library. ^ The Junior League of Washington (1977). Thomas Froncek, ed. The City of Washington: An Illustrated History. Knopf. ^ a b c d e f L'Enfant, Peter Charles; United States Coast and Geodetic Survey; United States Commissioner of Public Buildings (1887). 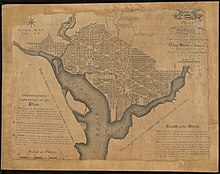 "Plan of the city intended for the permanent seat of the government of t(he) United States: projected agreeable to the direction of the President of the United States, in pursuance of an act of Congress passed the sixteenth day of July, MDCCXC, "establishing the permanent seat on the bank of the Potowmac": [Washington, D.C.]". Washington: United States Coast and Geodetic Survey. LCCN 88694201. Retrieved 2017-03-05. 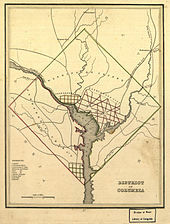 Facsimile of the 1791 L'Enfant plan in Repository of the Library of Congress Geography and Map Division, Washington, D.C.
^ a b Partridge, William T. (1930). 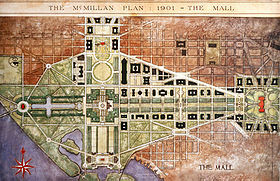 Design of the Federal City: L'Enfant Plan of Washington Superimposed on the Rectangular System From which He Worked. 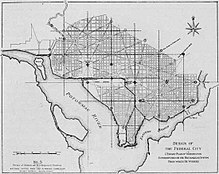 Chart 5: L'Enfant's Methods And Features of His Plan For The Federal City: Reports and plans, Washington region: supplementary technical data to accompany annual report: National Capital Planning Commission. Washington, D.C.: Government Printing Office. p. 33. OCLC 15250016. Retrieved 2016-12-04 – via HathiTrust Digital Library. 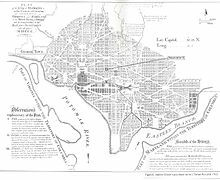 (2) "High resolution image of central portion of The L'Enfant Plan for Washington, with transcribed excerpts of key to map". Library of Congress. Retrieved 2009-10-23. (3) "Enlarged image of central portion of The L'Enfant Plan for Washington" (PDF). National Park Service. Retrieved 2009-10-23. (5) Faethz, E.F.M. ; Pratt, F.W. (1874). "Sketch of Washington in embryo, viz: Previous to its survey by Major L'Enfant: Compiled from the rare historical researches of Dr. Joseph M. Toner ... combined with the skill of S.R. Seibert C.E." Map in the collection of the Library of Congress. Encyclopædia Britannica Online. Retrieved 2012-04-03. ^ "L'Enfant's Dotted line map of Washington, D.C., 1791, before Aug. 19th". Library of Congress. Retrieved 2009-09-30. ^ "A Washington DC Map Chronology". dcsymbols.com. Retrieved 2009-09-30. ^ a b Ellicott, Andrew (February 23, 1792). "To Thomas Johnson, Daniel Carroll and David Stuart, Esqs." In Arnebeck, Bob. "Ellicott's letter to the commissioners on engraving the plan of the city, in which no reference is made to Banneker". The General and the Plan. Bob Arnebeck's Web Pages. Retrieved 2010-08-30. ^ (1) Phillips, Philip Lee (1917). 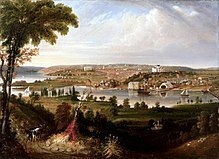 The Beginnings of Washington, As Described in Books, Maps and Views. Washington, D.C.: Published for the author. pp. 29–30. OCLC 420824175. Retrieved 2016-12-29 – via Google Books. (2) Bartlett, Dr. G. Hunter (1922). Frank H. Severance, ed. "Andrew and Joseph Ellicott: The Plans of Washington City and the Village of Buffalo and Some of the Persons Concerned". Publications of the Buffalo Historical Society: Recalling Pioneer Days. Buffalo, New York: Buffalo Historical Society. 26: 7. Retrieved 2016-12-29 – via Google Books. ^ Partridge, William T. (1930). L'Enfant's Methods And Features of His Plan For The Federal City. Reports and plans, Washington region: supplementary technical data to accompany annual report: National Capital Planning Commission. Washington, D.C.: Government Printing Office. p. 23. OCLC 15250016. Retrieved 2016-12-04. At HathiTrust Digital Library. 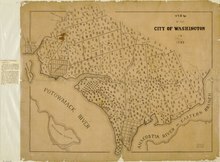 ^ a b "Plan of the City of Washington". Washington Map Society. Archived from the original on 2007-11-12. Retrieved 2008-05-02. .
^ "James Madison". Orange County, Virginia: James Madison Museum. Archived from the original on 2011-07-26. Retrieved 2017-05-27. Did Dolley Madison really save Washington's portrait from the British? 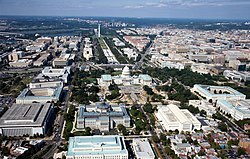 ^ "Which Washington, D.C. Building Was Burned Down in 1812? - Ghosts of DC". 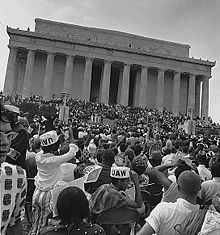 ghostsofdc.org. Retrieved 2018-02-19. 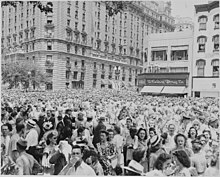 ^ "The Knickerbocker Theatre Tragedy - Ghosts of DC". ghostsofdc.org. Retrieved 2018-02-19. ^ U.S. Department of Defense. "The Pentagon: Facts & Figures". Archived from the original on April 14, 2012. Retrieved 2013-01-25. ^ "Washington's Black Majority Is Shrinking". Associated Press. September 16, 2007. Retrieved 2008-07-12. ^ "Census 2000 Demographic Profile Highlights". United States Census Bureau. 2001. Retrieved 2008-11-02. ^ Frey, William H. (May 2004). "The New Great Migration: Black Americans' Return to the South, 1965–2000" (PDF). The Brookings Institution. pp. 1–4. Archived from the original (PDF) on April 28, 2008. Retrieved Mar 19, 2008. Bryan, Wilhelmus Bogart (1914). A History of the National Capital from its Foundation through the Period of the Adoption of the Organic Act. 1: 1790-1814. New York: The MacMillan Company. OCLC 902842081. Retrieved 2017-12-27 – via HathiTrust Digital Library.